Forget the Kindle news today; I've got abetter deal for you. Target are currently selling the iriver Story HD for $99. That's $40 off the retail price, and given the features it is right around the price it should have been all along. 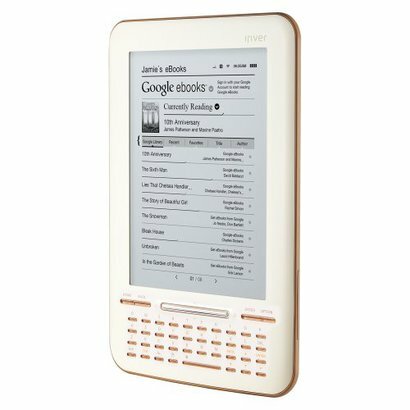 This was a rather pretty but unremarkable ereader when it debuted a couple months back. It's based on the latest generation high resolution 6" screen, and has Wifi, SD card slot, 2GB Flash, and as you can see from the image it also has a keyboard. You can load ebooks from any number of ebookstore or you can buy ebooks from the Google eBookstore on the device itself. It didn't make much of a splash when it launched, but I did find one interesting quirk. It has a hidden web browser. It wasn't terribly useful, but looking for the browser was fun. Especially after the reveal of the new Kindle models I am disappointed in the lack of devices that have the latest generation higher resolution e-ink display. If this once feature was most important to me would you recommend the iRiver or another device. Or would you tell me that the higher res isn’t worth it? It’s worth it if you’re into pdfs. Otherwise, the gain in text sharpness will be marginal and might result in slower page turns.